We arrived in Beijing at 6.15am and it was eerily quiet. By 7am we were at the hostel and showered, so decided to explore the surrounding streets. 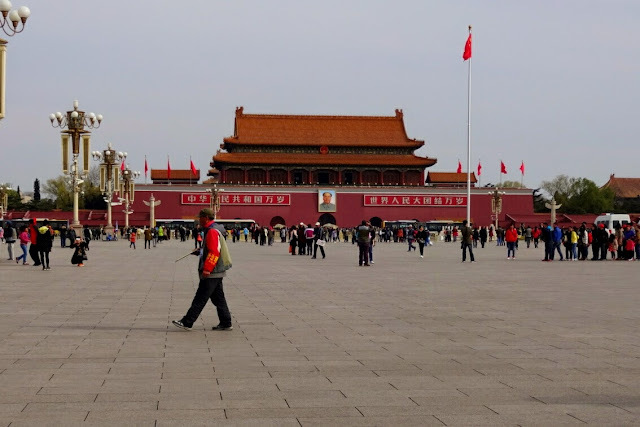 We were staying in central Beijing, smack in the middle of the tourist district surrounding the Forbidden City and Tiananmen Square, but the entire area doesn't feel as I imagined it. There is no pollution, small alleyways (called Hutongs) and many one story houses - very far from the cosmopolitan city of skyscrapers I had expected! These small backstreets were full of people playing with children, hanging their washing to dry, or selling food. Obviously there are streets which are very westernised and contain shops such as Zara and McDonalds, but these are in the minority. This wasn't the Beijing mega-city I had expected. 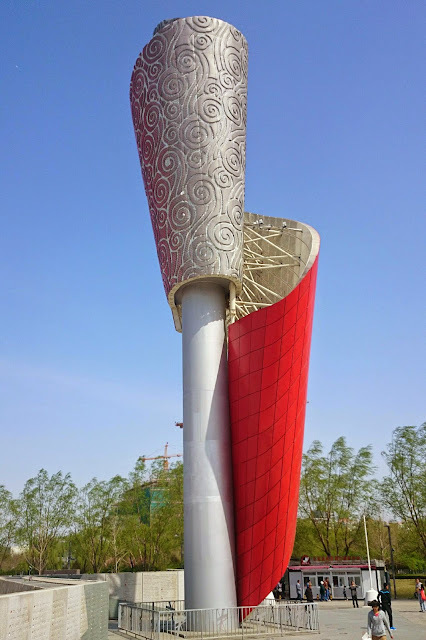 On our way back from the Great Wall we stopped at the Beijing 2008 Olympic Park complex. The buildings were quite impressive - the water cube (now a water park) and the birds nest, both fan favourites. 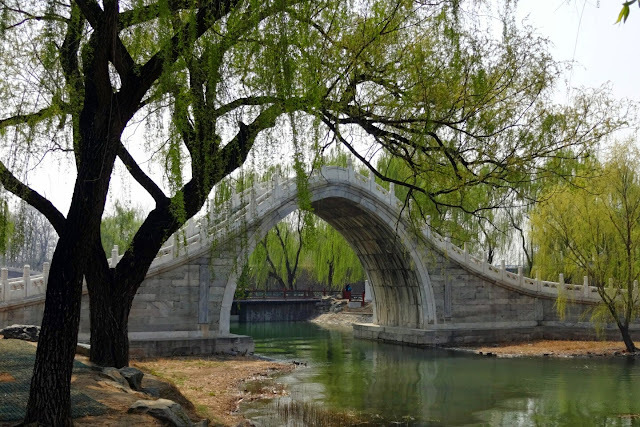 The open space and parks surrounding the complex, once again, did not resemble the Beijing in my imagination. 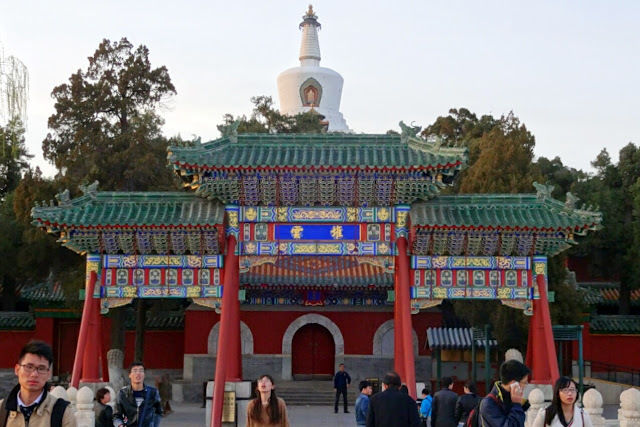 In the evening we decided to explore some other regions of Beijing, to see if we could find the city we expected. We walked past the infamous Tiananmen square and the Forbidden City towards the Hou Hai district. 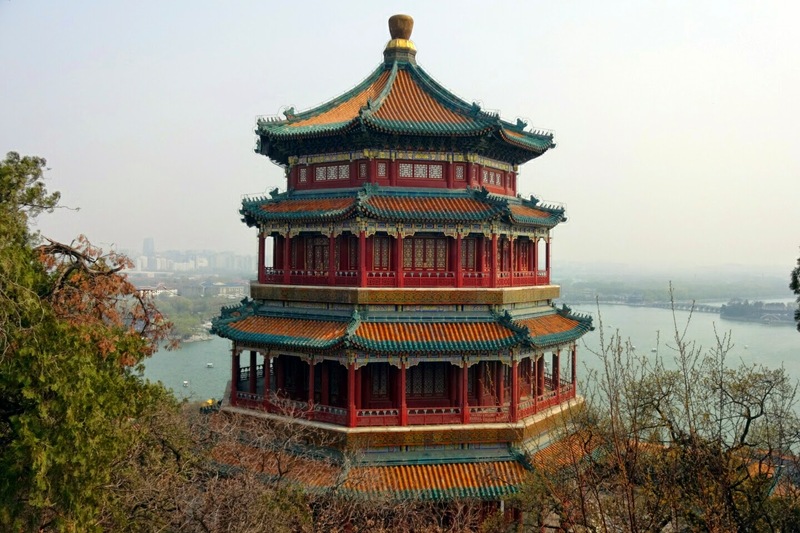 The most direct way to this district was through "Beihai Park". This park was beautiful and emphasised the importance that China place on having parked areas in cities. Unfortunately, Beijing's evenings were much colder than we had anticipated and we were not dressed for the temperature, meaning we didn't spend as much time looking at the park as I would have liked. When we left the park we came across the Hou Hai district - it was beautiful and vibrant at the same time! Pubs, clubs and restaurants surrounded a big lake with people singing in the club's and candyfloss everywhere! 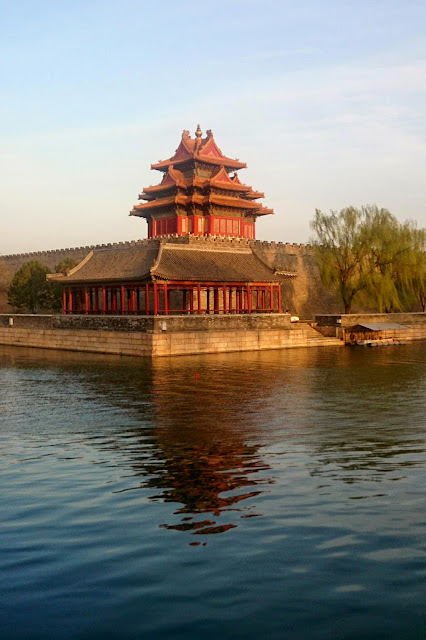 The next morning was a group trip to the Forbidden City and Tiananmen Square. Getting into the square is a nightmare! In order to get access to the square you have to go through a security check with police officers. We went through the tour group entrance but the police officer didn't believe that Jim was our tour guide and began shouting at him. I joke not, I thought he was going to get arrested. 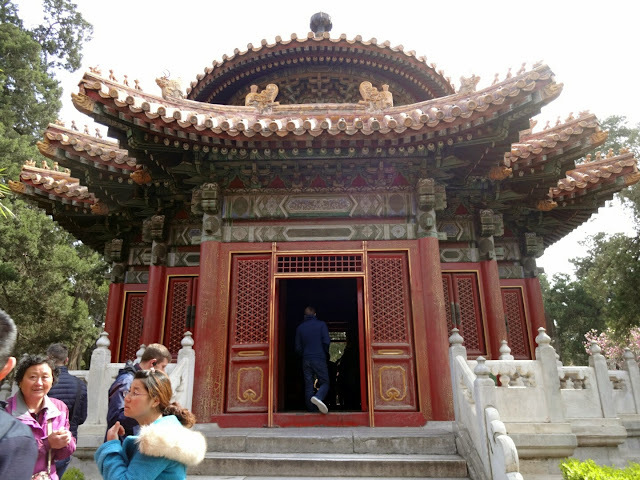 When we finally got into the Forbidden City we realised that the group were going to love through it too quickly for us, so, regrettably, we left the group and explored alone. The Forbidden City wasn't as I expected, most of the buildings looked the same - same style, same colours. They had been rebuilt several times since their original construction, so I'm not even certain this was the original design! 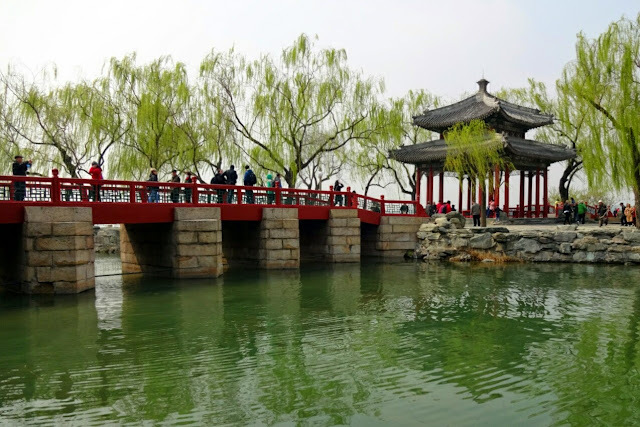 At the north exit of the Forbidden City is another park - Jingshong Park. 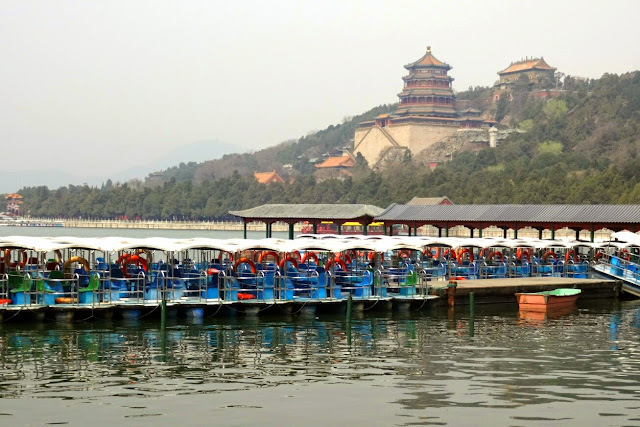 This has a hill at the centre which allows for views over the Forbidden City. The view from here was really impressive, more impressive than the view from inside the complex! You can't get a feel for the layout and grandeur of the buildings from so close, I would definately recommended the park before you go into the complex! After a couple of very busy weeks, I had a very early night (7pm). So the next day we decided to take it easy. The previous day the rest of the group had visited Beijing's Fake good market - Pearl Market, so we decided we should also see it. When we arrived at the fake goods market, immediately people began asking if we wanted Beats or GoPros. The initial prices people asked for the goods was amazing, some starting at over 9x the price they agreed to sell it for. If you spent too much time bartering with one person and didn't buy anything, they became very upset - chasing you down the store and grabbing you, until you agreed to their extra low price! It seems strange that this market is renowned for selling fakes of high end reputable brand's and yet there was no security trying to prevent it being sold. This afternoon was the first time we said goodbye to our 'The Dragon Trips' tour group - although we could potentially run into them in Shanghai, the small amount of cross over time makes it unlikely. It was lovely to meet them and spend time travelling in China with them. 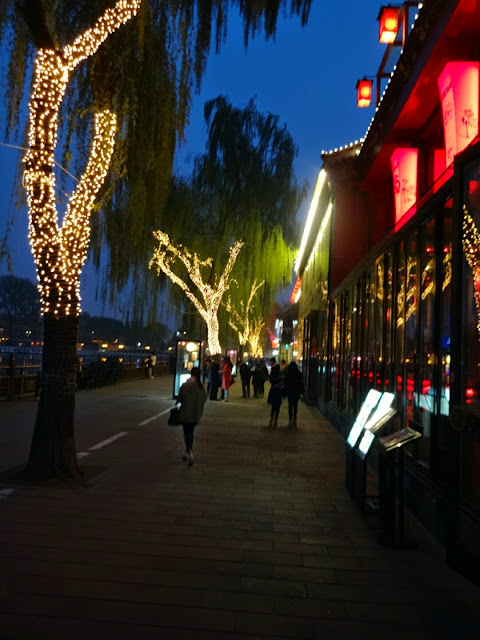 In the evening, we headed towards the financial district and to Chaoyang Park. This was the first time since arriving in Beijing that it felt like we were in a capital city. There were large roads, tall buildings, expensive hotels and we found our first shopping mall complex! The park was a little disappointing - it was dark and had hardly any lighting, so we were unable to see it! On the way home i was reminded of how cool Beijing metros are. If you look out of the window whilst in the tunnels, you can watch weird videos of fish or people! On Wednesday we were back to serious tourist stuff, none of these easy days. We went to the Summer Palace - a holiday home built in the Qing Dynasty. This impressive complex is over 300 hectares in size and 75% of it is covered in water. 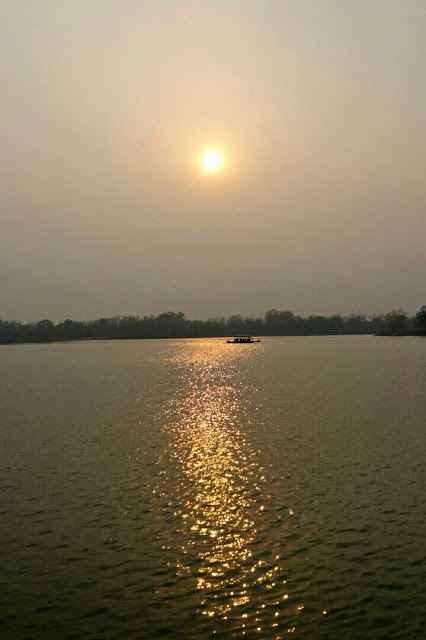 The view from the edge of the lake was amazing and very relaxing (once again, not like how I expected Beijing to be). On Thursday I awoke feeling very rough, my cold was in full swing - my eyes were swollen and watery, my nose wouldn't stop running and that irritating cough persisted. As a result we had to change our initial plans to some less strenuous activities. In the morning we went to the Mao memorial building in Tiananmen square. This is Maos final resting place, where he has been preserved like a wax model for thousands of Chinese people to pay respects to each day. The whole situation is very strange, you aren't allowed bags into the building and phones must be switched off. You walk silently through two rooms. The first has a tribute statue of Mao and people lay flowers at his feet. The second is where Maos body is. Before entering this room, guards make you take your hands out of your pockets, stand tall and walk at a continuous quick pace. This means you spend around 30 seconds in the room with Mao before being ushered out of the building. Following this, we went to the Chinese National Museum. This was mainly to witness the propaganda that the CPC (Communist Party of China) would spread and to understand more about the cultural revolution that transformed China from an Imperialist State to a communist one. It was very evident that the museum was run by the CPC, focusing on their triumphs and ignoring other factors. The main exhibitions were the "revolutionary road" showing how the CPC changed China for the better and "Ancient China" describing Chinas history and the different Dynasties that ruled it. 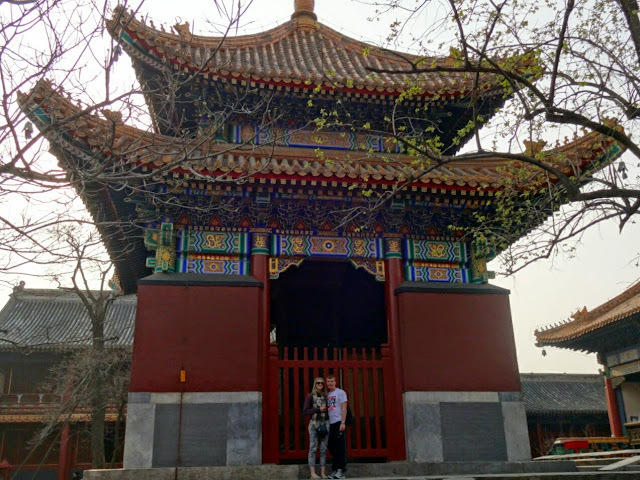 In the late afternoon we headed to the "Lama Temple". It was formally an imperial palace, later converted into a Tibetian Buddhist Monestry. In one of its halls - the Pavilion of Ten Thousand Happinesses - stood a 26m tall statue of the Maitieya Buddha, carved from a single piece of white sandalwood and is an artwork included in the Guinness Book of Records in 1993. I think the area surrounding the temple was more impressive - little coffee shops and shops that sold ornaments adorned the streets leading to the Nanluoguxiang region. This region was my favourite so far in Beijing - little Hutong streets lined the main shopping spots with people selling everything from food to games to clothing! Each Hutong that lead away from the street looked equally exciting. Eventually we headed out of the district towards the Drum Tower. Here we found a restaurant where, for the first time in Asia, I had egg fried rice - it was amazing! Hopefully I will be able to find spring rolls soon! 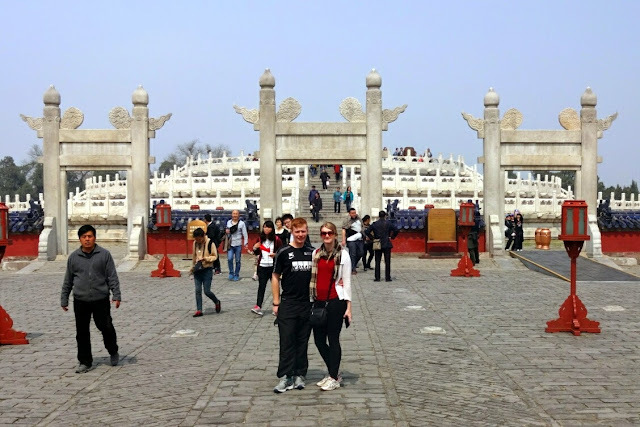 On our last day in Beijing we finally visited the Temple of Heaven. 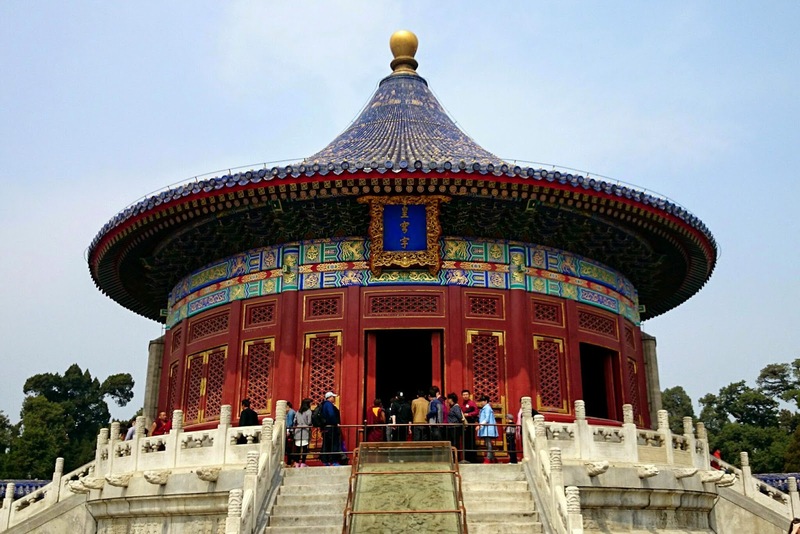 The Temple of Heaven is the largest space dedicated to worship in the world. After reading some bad reviews about it, I was a little bit apprehensive but this was unnecessary - the complex was beautiful. We entered through the south gate, as the Emperors would have done when they used the temple for worship. This lead us onto a direct path to the two key worship buildings in the complex - the Circular Mound Alter of Heaven and the Imperial Vault of Heaven. These two buildings (although similar in style) felt very different from other buildings we had seen - rich blues were included as well as the lucky colour red. 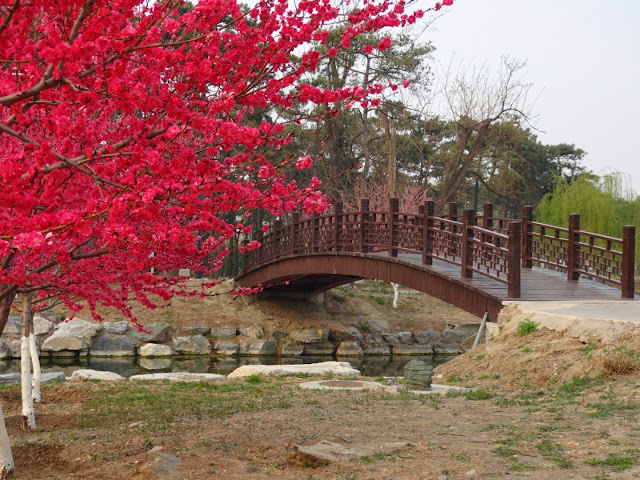 Then route then moved towards a double-loop longevity pavilion. The building was really cool and looked as if three quarters of it was reflected in a mirror. Unfortunately, the surrounding flower and rose gardens were not in bloom, but this didn't detract from the overall beauty of the complex. 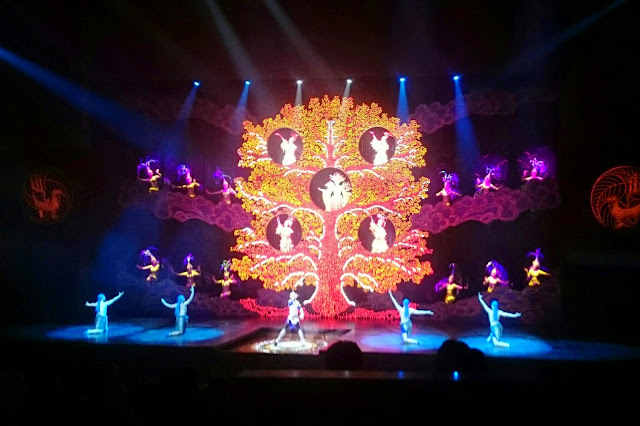 In the evening we attended a Chinese show - "The Golden Mask Dynasty". The show was actually very impressive - the staging alone was insane, with giant 3D backdrops and even a flood scene with real water flying everywhere! At the shows core was a classical ballet, with some really pretty dance scenes. The show was definately worth seeing and I would recommend it to anyone visiting the Beijing area! Overall I really liked Beijing. It wasn't at all what I expected. People wearing masks were in the minority, no pollution and less busy than some of the other cities we have visited! The city also has more pretty places than industrial - a tourists dream!